I am building a new menu but for some reason, I notice a weird blur on the fonts in the menu. This shows up mostly on a PC in the Chrome browser. Can you help? I just purchase the CSS3Menu and have a question. How can you take the border lines off the menus? I'm playing with your CSS3Menu program. Is it possible to create a Menu and then put a link to it on the web page? I'm testing free version of CSS3Menu. 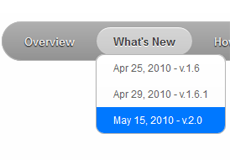 What is the difference between free and business versions? What features will I get with business version? I am trying to use the CSS3 menus and everything looks good, but I am having difficulty with styling an active link.